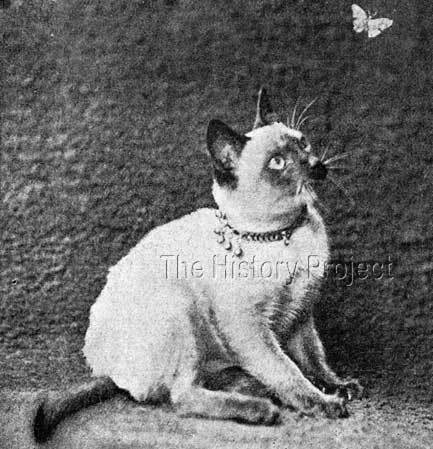 The charming photographs of 'Cora' in Frances Simpson's The Book of The Cat (1903) have delighted and inspired fanciers of Siamese cats for well over a century. Cats such as 'Cora' and 'Eve', 'Ah Choo' and 'Polyphema', also carried the banner for the females of the breed, and as founding mothers to this new and emerging force within the Fancy. The writer can certainly identify with this experience, having felt similarly impressed when first laying eyes on a 'row of Siamese kittens' penned for a show. The image is one of pointed patterns and wonderfully deep blue eyes, like sapphires drawn from the water. But equally this fascination can apply when first laying sight on a row of Himalayan Persian kittens, as the draw-card of both the pointed pattern and blue eyes, appears to be universal in its appeal to those who have only ever before seen predominantly solid or tabby coloured cats with yellow or orange eyes. The effect, if never seen before, is quite startlingly beautiful. The Himalayan of course, inherited its sensational colour from a hybridisation of the Persian, to the Siamese. So it was left to cats like 'Cora' to be ambassadors of the rising star of 'Royal Cat of Siam'. 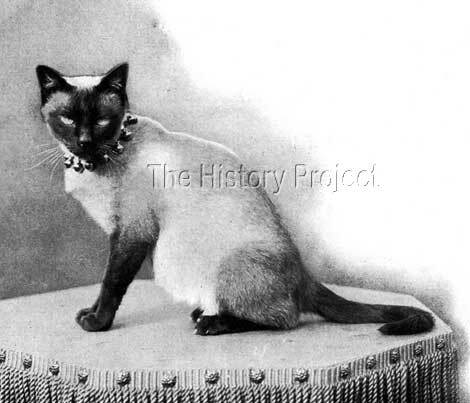 According to the Siamese Cat Register, compiled by Major E. Sydney Woodiwiss in 1924, 'Cora' was born in 1898. (exact date not known) and was bred by Messrs Wakefield and Lever, from an unknown sire and dam. She appears to only ever have been owned by Miss Armitage, of whom we have very little information other than she is recognised in the writings of Frances Simpson as one of the strong early supporters of the breed. Given Miss Armitage's view on keeping to small numbers, it would not be unreasonable to assume that both 'Sam Sly' and 'Chaseley Robin' being bred by Miss Armitage, that these two males could indeed both be sons of 'Cora' from an earlier breeding to 'Champion Wankee'. 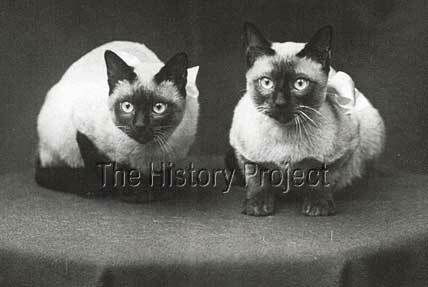 Two unidentified Siamese kittens of the era, presented ready for exhibition. 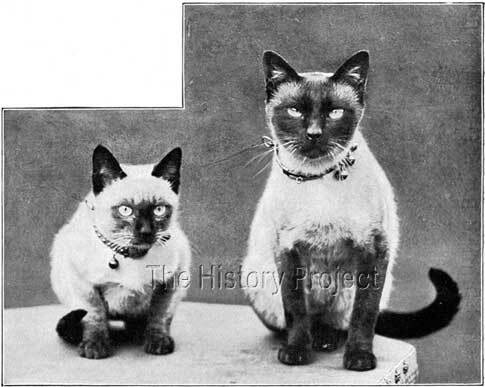 The Siamese Championship was won by Miss R. Armitage's Cora, who apparently is the happy possessor of all the virtues. No records exist for any siblings of 'Cora'. 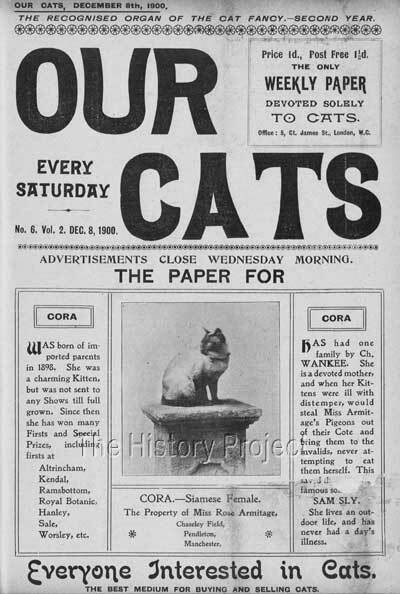 This is confirmed by two show reports that were published in the 7th February issue of Our Cats, the first being an excerpt from a report on the "Championship Show of the Northern Counties Cat Club" held at Manchester, on 29th January, 1903. "Cora, the mother of my Siamese cats and kits, is still a beauty, and I really think she improves with age"
Although we are informed by Miss Armitage that 'Cora' was the mother of her Siamese cats and kittens, (indicating earlier successful litters from her), we can only find three kittens, of which only one is recorded an official register. These were 'Chaseley Mascotte', (a female), 'Chaseley Valentine', (a male), and 'Chaseley Robin' (presumed male). The first has a recorded date of birth of 14th April, 1902, which matches precisely to her age in a commentary by Miss Armitage, given to Frances Simpson for The Book of the Cat. 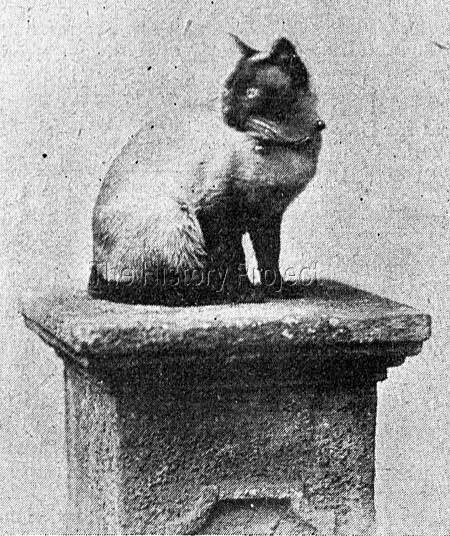 The last, given that he is accorded a Championship and mentioned in Cats and All About Them (1902) suggests that he may in fact have come from an earlier litter than that which produced 'Mascotte' and her litter brother 'Valentino'. The next two males, are both confirmed as sired by 'Ch.Wankee',and both are confirmed as bred by Miss Armitage, however there is no direct connection to 'Cora'. But it is distinctly possible, if not likely, that both could be from an earlier breeding between 'Wankee' and 'Cora'. No verifiable progeny from any of the above three cats have yet been found. Our Cats Magazine, Cover Page, featuring 'Cora'.